Vladimir Putin has fulfilled his election campaign promise to create a position within the government to protect the rights of entrepreneurs. Newly appointed Business Ombudsman Boris Titov spoke with Maxim Rubchenko of Expert magazine about the position and how he plans to use his authority. Expert: Many observers have noted that the mere appearance of the business ombudsman means that traditional institutions – courts, law enforcement agencies – do not perform their functions properly. Do you also think so? 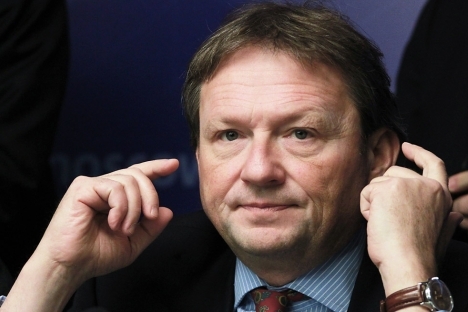 Boris Titov: Speaking on behalf of the entrepreneurs, today we, of course, do not believe in transparency and objectivity of the Russian court and its professionalism, although the court performs its function in a minimal volume. In general, building a serious, effective corporate system in our country on the basis of the existing judicial system and law enforcement institutions probably is impossible. The problem is not even in the legislative sphere – we have a well-developed legal framework. But the enforcement is disgusting. This is purely a management issue, and, unfortunately, the bureaucratic, non-competitive system that now exists does not allow the legal mechanisms' efficient functioning. Therefore, we need new tools that provide more effective enforcement. Expert: In this regard, how do you see your mission as an ombudsman? B.T. : Ensuring that we would have a normal, open economic system, in which the trader feels comfortable. Of course, one is never 100 percent satisfied with the existing conditions – there is no black and white, there are always various shades of gray. But the dominant color should be clearly light gray. Today, each investor coming to Russia is afraid that his property will be taken away—Hence the belief that it is impossible to develop here on a long-term basis and that short-term projects only are allowed. As a result, we have more portfolio investors than strategic ones. Only those who count on the kind of crazy profits that will pay for the high risks come here. Today, of course, we have to change the whole system. We now have an economy built on raw materials, but such a model involves serious development of the state economy in particular and, consequently, strengthening of public administration. Therefore we have many officials, and each of them is trying to capitalize on their power capabilities. Therefore, corruption is growing along with the development of the raw material model. And today, the main problem for business is not just raiding, as before, when entrepreneurs were splitting the property among themselves, but bureaucratic raiding. We often see the seizure of business by officials, and they do not even hide it. Therefore, the main task is to put a barrier against using power to take a business from the entrepreneur. In addition, we have 13,600 people serving prison terms for economic crimes. The total number of those convicted of economic crimes – that is, the number including those who are on suspended sentences and the criminal records that have not been withdrawn, is some 120,000. Thirteen thousand may not seem like much, but 120,000 convicted – is a huge problem. Plus there are a lot of criminal cases that did not make it to court. According to our estimates, one in six Russian businessmen has been prosecuted for economic crimes. This, of course, should be stopped. Expert: When will you know exactly what authority will be given to you? B.T. : We now know of several kinds of powers, which were named by the President in his speech at the St. Petersburg Economic Forum. The first one is the ability to suspend the regulatory departmental acts, i.e. legal regulations. This is a very serious power. Of course, if we get the right to suspend a tax or a sanity check, we must learn to use this tool to do no harm. After all, if, in the public opinion, we are associated with some corporate disputes, it will be a very bad situation. Boris Titov holds a degree in International Economics from the Moscow State Institute of International Relations (MGIMO). From 1983 – 1989, he worked at the Soyuznefteeksport foreign trade association, a state-owned company that exported crude oil and petroleum products. He specialized in the supply of petrochemical products and industrial oils in Latin America and the Far East. From 1989 – 1991, he was the head of the Department of Chemistry at Urals, a private joint Soviet-Dutch company owned by prominent businessman Gennady Timchenko among others. In 1991, Titov created his own company to trade in petrochemicals and gas goods – Solvalub Ltd, London, which later grew into the SVL Group of Companies. In 1996, a Russian subsidiary of SVL, JSC Interkhimprom was established. In 2001-2002, Titov was the president of Azot Agrochemical Corporation CJSC – a joint-venture of SVL and Gazprom, which became one of Russia's largest producers of mineral fertilizers. In 2002, after the sale of shares in Azot AC, he returned to the post of chairman of SVL. In 2004, he was elected chairman of Delovaya Rossiya, a non-profit promoting the rights of businesses across Russia. The second power is the right to represent the interests of business in courts and turn to courts under our own name. This is a very important function, because now entrepreneurs are afraid to fight in court against officials and security forces. Everyone understands that it is easier to agree with the security forces than to get involved in a long conflict with very serious risks with them. Therefore, the Ombudsman’s ability to remove from the entrepreneur the risks of direct dealings with the security forces, including the judiciary ones is a very important point. In addition, the president mentioned the important power of the right to represent the interests of an unlimited number of persons in the courts. For example, there is a group of product manufacturers, who are illegally persecuted by the sanitary inspection. We can go to court on behalf of the unlimited number of producers and sue the sanitary inspection. This is a very serious power that only the prosecutor's office has had until now. Expert: Some media have called your office that of the “chief lobbyist.” How would you comment it? B.T. : If I'm going to honestly and openly lobby for the interests of Russian business and achieve success, meaning that the business climate will improve in our country, I will assume that my main task has been fulfilled. Lobbying for the interests of separate corporate entities is another matter. I can say one thing: we will protect individual companies; we will be lobbying both on separate occasions for the interests of companies in terms of protecting their rights and we'll lobby for changes in the corporate system as a whole. But we shall not do it for bribes for sure. That was probably the reason the president decided to appoint a businessman as a commissioner for the protection of the rights of businessmen rather than an official. This interview was abridged from the original version, published in Russian in Expert magazine.